Let me introduce you to Wayne. He's a cowboy. He'll protect you from rustlers and bandits, while winning your heart with his charming smile and humble manner. After much worrying, hair-pulling, and failed attempts, I finally have a cow pattern that I feel is worth sharing. It will be available in my shops starting tomorrow (I want to do one more proof-read before putting it out there). It's a bit of extra work, and you have to be comfortable with sewing. The spots are all knitted separately, then sewn onto the stuffed body. Not that I think you aren't capable of intarsia, but the pattern was simpler this way (even if it doesn't seem like it at first). Plus, it gives you freedom to knit as many spots as you want, and place them where you want. I think someone mentioned something about a long-horn version. I don't have time to knit it right now, but check back tomorrow for instructions for longer horns on dpn's. The vest is a modified version of the Easter bunny's waistcoat. It looks super cute if you embroider little western-type decorations on it. I went with simple v-shapes on the shoulders and back. The pocket is just an extra little detail, not essential if you think it's too fussy. Then all you need is a little triangle of fabric to knot around his neck, and he's ready to go! Wayne is adorable!!! Nice work. 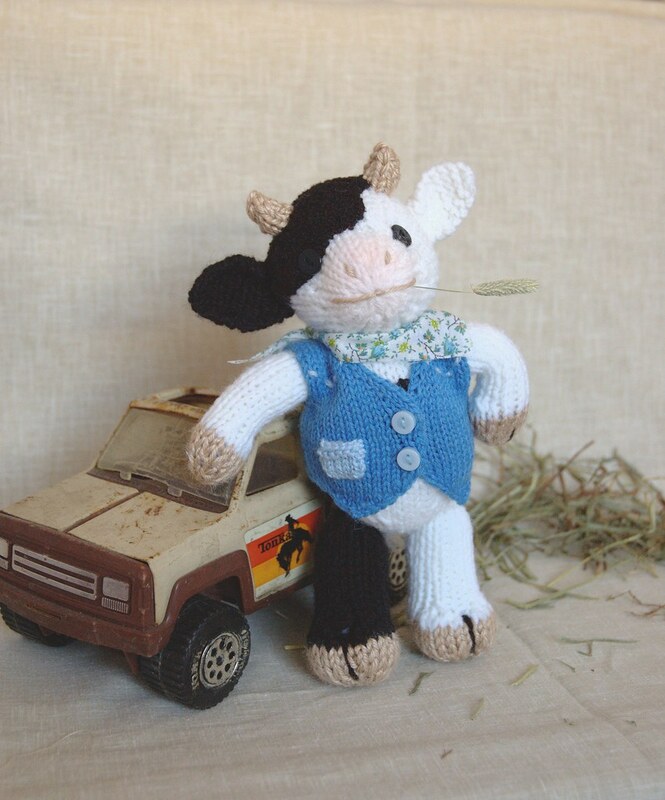 I may have to invest in that pattern, now that I have a grandson who will certainly need a stuffed cow! February 12, 2008 at 7:13 p.m.
Is Wayne the same size as the rest of your critters (except the big bear)? February 13, 2008 at 2:21 a.m. AAAW!! isnt he just the cutest little thing!!! Will be buying that pattern for sure! February 13, 2008 at 11:15 p.m.